A 60-mile pursuit that lasted for over an hour Wednesday morning came to an end with a head-on crash in a busy portion of Tempe. Department of Public Safety troopers began following the suspect's vehicle from the West Valley along Interstate 10 around 10 a.m., after he fled from a traffic stop. DPS spokesperson trooper Kameron Lee says they initially attempted to stop the driver, later identified as 31-year-old Mitchell Timothy Taebel, on State Route 85. Troopers tried to stop Taebel's vehicle by laying down spike strips on SR-85, but he was able to go around the strips and continued onto I-10 towards Phoenix. DPS troopers followed in marked vehicles until I-10 at 59th Avenue, where a DPS helicopter followed overhead. Several unmarked vehicles continued to follow the vehicle from a distance. Taebel continued onto Loop 202 into Tempe and exited the freeway at Scottsdale Road. 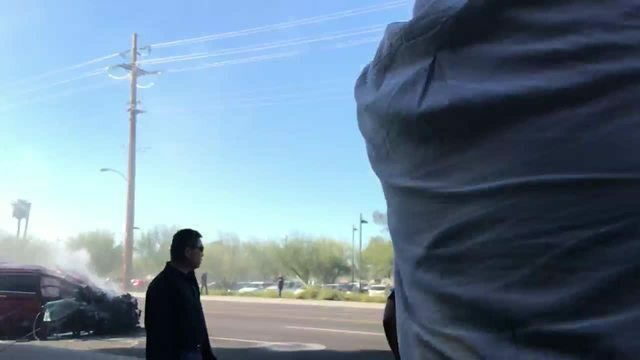 Taebel continued down Scottsdale Road, which turns into Rural Road, when he came to a stop at Rio Salado Parkway and authorities attempted to box in his vehicle. "At that point, two of our unmarked vehicles attempted to box in the vehicle and take the suspect into custody," Lee said. "The suspect veered to the right and rammed one of our patrol cars and continued southbound at a high rate of speed." Soon after, the suspect crashed into a black SUV at a high speed after driving through a stop light at Spence Avenue. Aerial footage showed Taebel jump out of the vehicle and attempt to flee before being taken into custody. 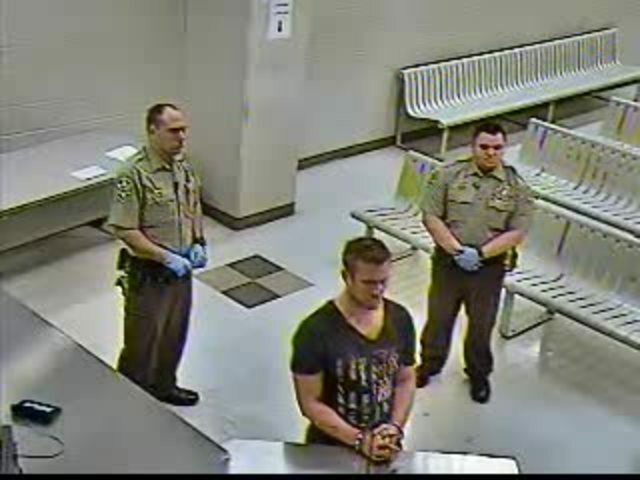 Viewer video showed Taebel talking to witnesses just before DPS arrived. A 47-year-old woman was the only person in the black SUV. She was transported to the hospital with non-life threatening injuries -- a broken hand and foot. DPS is facing questions about whether troopers handled the pursuit correctly, especially since DPS overhauled their pursuit policies in recent weeks. The new policy, instituted November 9, 2017 , affords troopers greater freedom to continue to pursue suspects. According to DPS's previous pursuit policy ( which are listed on DPS' website ), troopers would have likely violated multiple provisions meant to keep the public safe. Specifically, the previous polices state pursuits shall not be initiated after non-hazardous traffic stops. The policies also outline several circumstances when pursuits should be terminated, including when suspects drive off highways and into congested areas. The new policies do not have strict instructions about when troopers shall terminate pursuits. It said that pursuits should be terminated "when the risk outweighs the need for immediate apprehension of the suspect." It then lists 11 factors that "shall be considered." Both policies required all DPS units to have their lights and sirens on during the entire pursuit. However, aerial footage shows that when troopers attempted to pin the suspect's at a busy intersection, none of the DPS vehicles had their lights or sirens on. 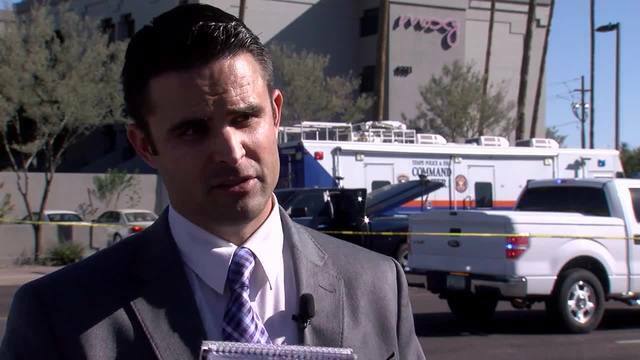 When asked by an ABC15 reporter why DPS didn't suspend the chase, a spokesman declined to comment. "We're not going to comment on that right now, OK. We're done. Thank you," spokesman Kameron Lee said. ABC15 cameras were rolling as Taebel made his way to the 4th Avenue Jail in downtown Phoenix just after 6:30 p.m. Wednesday. According to court paperwork, Goodyear police got a 911 call from Taebel at 10:26 a.m. on Wednesday. Dispatchers attempted to get him to pull over but he hung up on them. At 10:41 a.m., a DPS negotiator contacted Taebel. He told DPS he did not want to stop due to the unlawfulness of the traffic stop and wanted a peaceful resolution. He cited a Federal Code and stated it would be lawful to take an officer's life to preserve his freedom. Taebel is in custody for unlawful flight from a law enforcement vehicle, five counts of aggravated assault, exceeding speeds of 85 miles per hour, reckless driving and endangerment. The 31-year-old has a criminal history and is known to resist police contact. He is from California and Indiana with no known Arizona address. His California license lists an address in Los Angeles. Take a look at the map below for the approximate route of the Wednesday morning pursuit.